If you’ve noticed that there have been few valaida.com stories during August, well let me tell you why . . . August is Black Philanthropy Month!!! Just check out the volume and range of stories here. PHILANTHROPIC INVOLVEMENT: Currently I work for Echoing Green, which provides seed support to a diverse group of emerging social entrepreneurs every year. Specifically I manage the search, selection and support of the Black Male Achievement Fellowship Program. My mothers family; with nine aunts and uncles I grew up knowing a communal family where everything was rooted in common benefit. I just remember whenever there was a problem it was like an episode of House where we all chipped in to think about a solution. As a kid, it’s not too fun but when you get older you appreciate how important this support is both emotionally and for your confidence. How does that memory influence your philanthropy and your work in philanthropy? I think about the changing nature of family life and the need to ensure there is a village of support for young people to be able to think and dream with confidence. I didn’t mind taking risks because I knew I had a support system to both protect me but also hold me accountable. I think about the role of philanthropy as risk capital to influence the innovation and creative thinking of solution makers to know they will be held accountable while also be supported in their work and life. Tell us about Echoing Green—its history, mission and program of work. Echoing Green (EG) is a nonprofit global social venture fund that identifies, invests in, and supports some of the world’s best emerging social entrepreneurs—society’s change agents. Echoing Green invests deeply in these next generation change agents as well as works to create an ecosystem around them that supports and celebrates social innovation as a high-impact strategy for social change. Since our founding in 1987 by General Atlantic, a leading private equity firm, Echoing Green has provided more than 520 emerging social entrepreneurs working in forty-nine countries with $31 million in start-up funding, customized technical and other support services, and access to our global network of champions. What can you share about the emergence of the field of Black Male Achievement? And what’s your current work in the field? 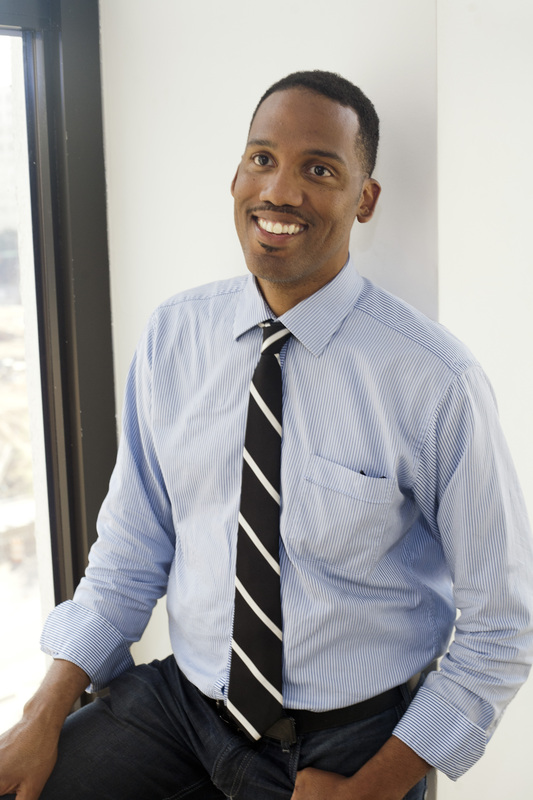 I am proud to support the Open Society Black Male Achievement Fellowship at Echoing Green. 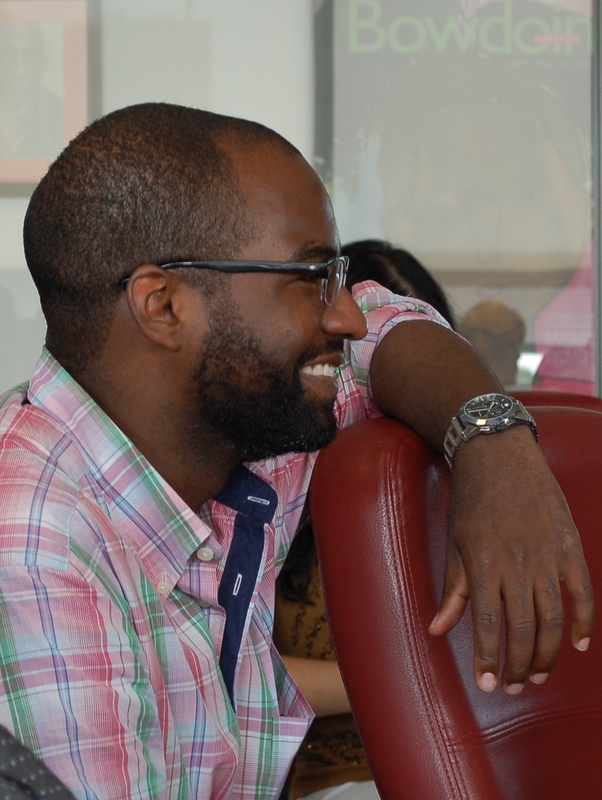 Established in 2011, in partnership with the Open Society Foundations Campaign for Black Male Achievement, the OSF Black Male Achievement Fellowship is the first fellowship of its kind targeting new and innovative organizations dedicated to improving the life outcomes of Black men and boys in the U.S. The 18-month fellowship offers $70,000 in seed funding, mentoring and support from Echoing Green staff and experts, skills-building conferences and access to our global network of Fellows. With Fellows participating in both Open Society Foundations and Echoing Green activities and convenings, they are solidifying their permanent place in the network as Fellows and eventually as alumni. What aspects of the philanthropic realm or “third sector” drew you from your initial career in banking? And what keeps in this sector? I was on the board of a non-profit in Charlotte when I realized my personality and skills were suited for the types of organizations I interacted with during my civic involvement and at 25 years old, I feared never having an opportunity to see if I could be impactful in this sector. In 2007 when I left I immediately missed the intangibles of working at a large corporation—the systems, processes, and access to a knowledge-sharing infrastructure. What people also don’t think about with corporate spaces is the level of inclusive meritocracy. In philanthropy and non-profits so much is based on relationships and networks that it can be frustrating navigating the sector. In the six-plus years I have been in this sector, I see some of this changing with the increased dialogue about impact but it is still a challenge. A share of your work has focused on Millennials and your generation’s philanthropy and civic engagement. What have you experienced and learned that could benefit other Millennials as well as other generations? Don’t disqualify your potential role in solution making but also don’t assume your age makes you smarter. We went very quickly from saying young people are dumb and naïve to all the sudden referencing Facebook and assuming young people have all the answers. Like with many things in life, the answer is in the middle. Millennials have unique skills and perspective due to their proximity and relationship with new technologies but there is also vital context and knowledge that comes with experience and scenario testing. All of this poses new challenges but also opportunities that will require we are intentional about building the necessary nuance into the public conversations being convened by people like foundations and corporations. I feel like we should stop calling it a speech but reference it as a strategic plan. I like to think of it that way because it provided a pretty clear framework for how we should order society and how we should hold our democracy accountable—many tactics we have ignored (many of them here in NC). I think about my family and how we don’t always get along and we don’t always solve everyone’s problems but there is a prevailing sense of togetherness. It doesn’t get rid of drama or get rid of hurt feelings but there is a deep and almost innate sense of “we are all in this together” and we hold ourselves accountable to that. It isn’t a political philosophy but more something that seems natural in that it allows our senses to work on as blank a canvas as possible. I aspire to provide for “my sense of community” as blank a canvas as possible. When I started out in non-profits, I worked on Central Piedmont Community College’s campus where so many young people took extra time out of their day and found ways to push through the challenges and distractions in their lives to come talk about how to get involved in their community. I imagine how many of these young people couldn’t participate because of things out of their control that were in the way. I aspire to live in a society that sees our role as getting as much out of the way of these young, brilliant community members as possible. Seeing some of the first students I worked with at Central Piedmont Community College doing amazing things and paying it forward. They are so smart, thoughtful and driven and will do so much more than I could dream of—because they have lived it. How can readers with an interest in Black Male Achievement help advance this expanding field of work? Nearly a dozen interviews compose the series “Of Dreams and Mountaintops” and are slated for multiple media outlets including: Charlotte Viewpoint,Collective Influence, Mosaic Magazine,QCityMetro.com, The Charlotte Post (print version) and thecharlottepost.com. 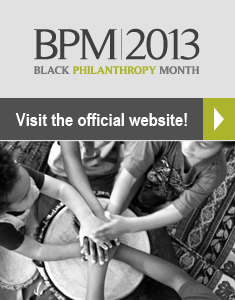 To get connected and involved in BPM 2013 during August and beyond, visit BlackPhilanthropyMonth.com and follow the hashtag #BPM2013 on social media. Described an “idea whisperer,” Valaida brings unbridled imagination and a gift for harnessing wild ideas to her work as a writer and project strategist. She is author ofGiving Back: A Tribute to Generations of African American Philanthropists. Follow at valaida.com, @ValaidaF and @BlkGivesBackCLT. Black Philanthropy Month 2013 begins this week, and it’s “An August of Dreams and Mountaintops.” Below is content from the media release about BPM 2013. The month of August has become a momentous time in the global history of the Black giving movement. 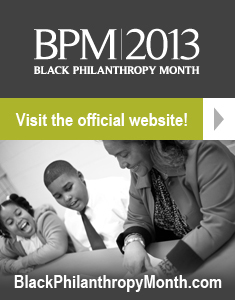 Entering its third year of observance, Black Philanthropy Month 2013 (BPM 2013) is an unprecedented coordinated initiative to strengthen African-American and African-descent giving in all its forms. High-impact events, media stories, service projects and giving opportunities compose the campaign, which kicks off in August 2013 and continues through February 2014. “Black Philanthropy Month gives our diverse communities an opportunity to celebrate and renew their rich, shared traditions of giving, self-help and innovation throughout the US and the world,” says Dr. Jackie Copeland-Carson, Executive Director, African Women’s Development Fund USA (AWDF USA). Coinciding with commemorations of the 50th anniversary of the March on Washington for Jobs and Freedom and Dr. King’s unforgettable “I Have a Dream” speech, BPM 2013 provides both time for reflection on the state of the “dream” a half-century later and calls for action to address the most pressing challenges of the 21st century. With a base of activities in place, the primary goals of the campaign are to inspire people to improve their communities locally and globally, give back in smarter and more strategic ways and transform people’s lives for the better. Self-organized events, community conversations and charitable fundraising in recognition of BPM 2013 are encouraged. Events across the country start in August 2013. Special gatherings taking place in cities nationwide include: a summit on Black philanthropy on Martha’s Vineyard; a Northern California benefit in support of improving maternal health in Africa; and a moderated panel discussion in Charlotte commemorating the 50th anniversary of the March on Washington while examining the history and possibilities of African-American giving and civic engagement. A regularly updated calendar of events can be found at BlackPhilanthropyMonth.com. BPM also aims to expand the ways that people give. Fund-raising efforts and community drives to be mounted and publicized in August and beyond include Black Gives Back to SchoolTM (school supplies and clothes); Community Investment Network 2013 National Conference (giving circles and collective giving); and AWDF USA’s Mother Africa Campaign (maternal health). “We expect to see more people giving in strategic, new ways as well as groups investing in Black philanthropic know-how and leadership, across generations,” says Valaida Fullwood of the Giving Back Project. “Empowering communities to be the change they wish to see will help shape the philanthropic landscape of the 21st century,” says Chad Jones, Executive Director, Community Investment Network. Beginning this August, help us renew the commitment of time, voice or money to be a part of Black Philanthropy’s future. Join the campaign to create a diverse global community that Dr. King spoke of, thousands marched for and you can participate in. African Women’s Development Fund USA (AWDF USA) provides a vehicle for effective American philanthropy to Africa and builds the capacity of the continent’s women for social change and sustainable development. Through its research, public information and convening initiatives, it also seeks to highlight the tremendous impact that African women-led philanthropy and nonprofits are having on the lives of their families and communities across the continent and Diaspora. BlackGivesBack.com (BGB) informs as the premier website on Black philanthropy since 2007, reaching readers in the U.S. and abroad and attracting major media attention. BGB uses original, in-depth and engaging philanthropy-themed story angles, vibrant imagery, features including “The Insider” that profiles African American donors and nonprofit and foundation executives, event coverage, celebrity philanthropy and more. Community Investment Network (CIN), formed in 2003, invests in cultivating donors of color and giving circles and has emerged a leading national resource that bridges institutional philanthropy and diverse, everyday givers. From developing a new cadre of philanthropic leaders to facilitating learning-centered approaches, CIN empowers its members to give their time, talent, treasure and testimonials to be the change they wish to see. The Giving Back Project (GBP) inspires by reframing portraits of philanthropy with stories, photography and community conversations. GBP emerged from the work of New Generation of African American Philanthropists (NGAAP-Charlotte) and led to the publication of Giving Back, the award-winning book by Valaida Fullwood that profiles African American giving. GBP ventures to ignite a movement of conscientious philanthropy by empowering a generation to recognize its power and responsibility to give back.